He is the Wizard Malkil. Legend has it that Malkil was once one of the greatest. So great, in fact, that even the renowned Merlin was his pupil. But alas, Malkil has gone mad with age, and turned his powerful magic to the dark side. You are Kuros, the only knight warrior brave enough to enter the woods of Elrond. Strong enough to wield the Brightsword. Powerful enough to ward off the demons, the undead, and the caverns of fire. And clever enough to discover where Malkil has hidden his prisoner. --From the NES Wizards & Warriors instruction manual. Play Wizards & Warriors Now! 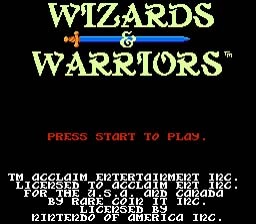 Wizards and Warriors was always one of my favorite games. I used to beat it almost every weekend. This is one of those games that never runs out of continues. The only thing they were counting on running out of was your patience. It did get difficult and aggravating at times. Just don't give up and you will succeed. This is a great game, and I suggest you give it a chance. There was a lot of fun to be had in customizing your character. There were items to find throughout the game that would improve your warrior. There were, in fact, more items than there was room in your inventory. That meant you had to make a decision sometimes. Don't worry though, they wouldn't put you in a situation where you needed an item that was unattainable. I recommend you find and keep the boots of force. They will open any chest that you find without needing the key. Be sure to find all three keys in each level for extra points. At the end of the game you will find Malkil waiting for you and he is pretty tuff. There are secret rooms throughout the game. Look for them by jumping around randomly.